Walnut Cinnamon Buns :: Oracibo.com - Food, Travel, Design and Cooking! Now I ask you, who doesn’t like a warm sticky cinnamon bun? It only takes a short time to put together the dough and then it’s just a quick matter to put together the filling and the mixture for the bottom of the pan that becomes the topping of the buns when turned out of the pan. 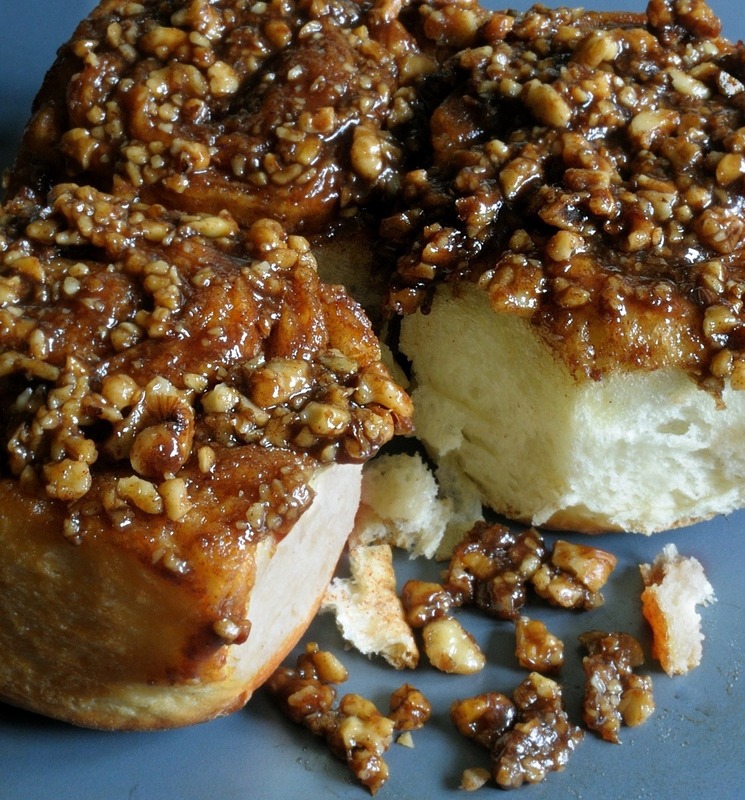 These cinnamon buns are so light and the topping is so good! I think you’ll love them! And they freeze very well. What a nice thing to have on hand! Heat the milk, water, sugar, butter & salt in a medium-size pot until lukewarm, stirring to dissolve the sugar & melt the butter. Place the mixture into the bowl of the mixer & immediately beat in the beaten eggs & yeast, then add 1 cup of flour to the mixture, beating well. Attach the dough hook & gradually work in enough of the remaining flour so the dough is smooth, elastic & just slightly bit sticky, approximately 4 minutes. Remove the dough to a floured work surface & knead for a minute or so, adding a little more flour until the dough is no longer sticky but not so much as to make a stiff dough. Place the dough in a lightly oiled bowl, cover with greased wax paper & a towel; place in a warm spot & allow to rise for 40 minutes or until doubled. Combine all the topping ingredients; spray a 9 x 13” metal baking pan with non-stick cooking spray & pour the topping mixture into the pan, spreading evenly. Set aside. Combine the brown sugar, cinnamon and walnuts; set aside. Punch the dough down & turn out onto a lightly floured surface. Roll out to a 18” x 14” rectangle. Brush with the melted butter, leaving a 1/4” border. Sprinkle the filling ingredients over the dough, very lightly pressing in. Starting with the long end closest to you, tightly roll up the dough jelly-roll fashion. Pinch the seam to seal. Cut the roll into thirds; then cut each third into 5 equal slices. Place the slices into the prepared pan, spacing evenly. Cover with a tea towel & allow to rise in a warm spot until doubled, about 40 minutes. Meanwhile preheat the oven to 375 F.
Place the risen buns in the oven & bake for 20-30 minutes, or until golden brown & sound hollow when tapped; leave in the pan for 4 minutes then invert onto a cookie sheet & allow to cool to warm before enjoying! What about the yeast?? It’s listed but then you don’t mention it when tI Ellington how tto o make them. Hi Tonya! Please accept my apologies for the omission in the instructions as to when to add the yeast! I have corrected it now and can’t tell you how much I appreciate you letting me know. My editor must have been drifting off dreaming about cinnamon buns or something. I hope, that you do make them and enjoy as much as we do. Funny thing…I’ve just been thinking about making them again!